The running pack/vest market has been booming in the last couple of years. Whereas previously there ware a handful of fell and adventure racing backpack producers, now every budget has a brand, feature set and following. Inov8 first moved into the vest market with the Race Ultra Vest, launched at OutDoor in 2013, taking the known formula and turning it on its head. Move forward two years and the Race Ultra 5 and 10 have been created. The Ultra 10 builds on the running vest style first seen in the award winning Ultra. The capacity has increased significantly, the hydration solutions redesigned and the usability moved forward. I took the Ultra 10 out to Chamonix to test it high on the alpine trails and ended up using it around town daily as my day pack. It is probably one of the only places you walk around looking like a trail runner and blend in with seconds. Try that on Oxford Street, in trail kit, and you’ll be looked at like some sort of strange alien. The Ultra 10 has a large main compartment which is capable of swallowing a large payload. Besides my shell, down jacket, food, GoPro, wallet and other random running bits, it was what you could carry when in town that impressed. Its not everyday you end up putting a Canon 7D with 24-105 L lens, 50mm lens, GoPro carry case, 3 tins of mackerel, down jacket, a box of rice, 24 chocolate biscuits, 4 sausages, 3 chicken breasts2 lemon meringue tarts and a banana in a running vest. Especially one that has an overall capacity of 10 litres and is designed to hug you and its contents, rather than let them bounce around. The hydration pockets were brilliant for holding a bottle of Duvel each, with the rear bungee securing an 800 gram brioche tear ‘n’ share. Now I wouldn’t recommend running with this, as it would certainly dig into your back, but cycling around the town to the campsite. Perfect. If only I had the pictures! But back to the trails. The main pocket can also be accessed from the rear of the bag, just down from the top of the back panel. This is good for getting in and out a hydration bladder, or if you have stashed something close to the back and don’t want to empty half the contents to obtain it. Now there is a 5 litre version available, and I like many others ran hypothetical scenarios through my mind as to which to chose. I have a tendency to go for a larger capacity, as I have a habit of carrying too much gear. With that in mind, when I traveled light, I never found the excess material to flap around in the wind, nor the contents lose support given the extra available space. What you carry is a personal choice, but I never found myself wanting more, or wishing I had less. It just worked. The external bungee can be used to secure a wet hardshell or extra kit that exceeds the capacity of the bag. Having ridden through Chamonix with a large brioche on the back, jumping off curbs on a trail bike, I can testify it keeps the contents secure if tied down appropriately. Moving down the pack you will find a large mesh pocket on either side. Running from the base of the main compartment to the bottle holder, at first I was a little confused. How will they hold onto anything? But, when I engaged my brain and saw the pull cord, it all made sense. Rather than a pre-tensioned elasticated pocket, these allow you to customise the fit. So whether you have a pair of ultra mitts, energy bars or a head torch, you can tighten the pocket to your own requirements. This made securing items easy, and just like the large main pocket, made entering and removing items that bit easier. There is no point having a pocket you have to fight to use. Hydration. Unlike many other options on the market, the Ultra 10 dispenses with having a couple of bottle on your chest. Instead the two 500ml soft flasks are located at the bottom of the main straps. When full, this made a noticeable difference, as there was no weight on the chest, nor were the bottles having to fight gravity to the same degree. You may ask how the supplied soft flasks can then be used, so low down on the body? Tubes are the answer, just like a hydration bladder. It’s best to think of these as mini hydration bladders. The tubes took a little getting used to, and they did flick around a bit, as rather than keep them in the top holsters, I kept them out for easy access. Now, they are a little more fiddly if you were to use these at an aid station, but for on the move, no longer are you required to remove them from the pockets. I thought I may not like them, but in the end loved them. The bite valves aren’t too hard, and get better with use and having your chest free allows for placement of gels, bars, phone and other small accessories which otherwise would be in side pockets or the main bag itself. Back to the pockets. They have a zip closure, which means if you aren’t using the bottles and instead opt for a hydration pack, they can be completely secured. It’s a shame more bags don’t incorporate this feature. The shoulder harnesses contain two stretch mesh pockets either side, which could fit a Sony Z3 Compact, large energy bars and gels – 4 of the latter at a push. The top closure gives confidence, as the canopy of stretch mesh holds anything which may otherwise decide to jump out on technical terrain. In the end when running up to a refuge in the Chamonix valley, I used one pocket for rubbish, two for nutrition and the fourth for my phone. Twin sternum straps hug you and keeps the bag firmly in place. They have enough stretch for your expanding chest and the whistle is bloody loud! I tested this indoors, only giving it a short blast. It is surprising how many of the inbuilt whistles are useless at their one task, however this one works just fine (My ears rang for a bit afterwards). However, a word of warning. Do not remove it unless you really need to, otherwise you may never find it again if you drop it. It’s tiny!! The pole loops work well. I could place poles in them on the move, however how effective they are will depend on your poles. Mine were folding, with quite short sections and I found the top end would pop out now and again. There are two sizes of bag, and I opted for the Medium to Large. I am normally a small and for reference, I’m 5ft 7”, which gives a sense of scale in the images. Try before you buy as ever. The rear of the back has a stretchy mesh which has only one seam (the rear hydration opening) leaving a very comfortable and hot spot free harness system. 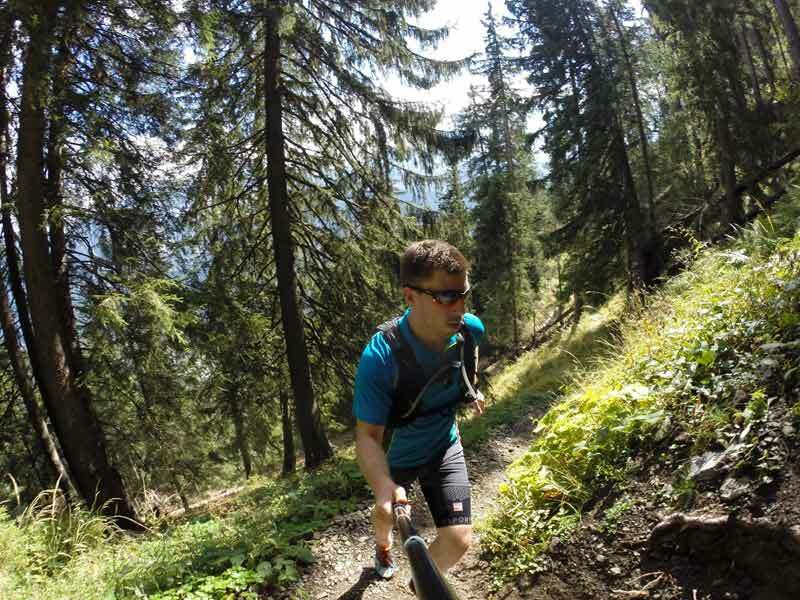 Having lugged my cameras, dinner and random kit around Chamonix, along with running up the trails and the VK course, I never found any irritation or discomfort. 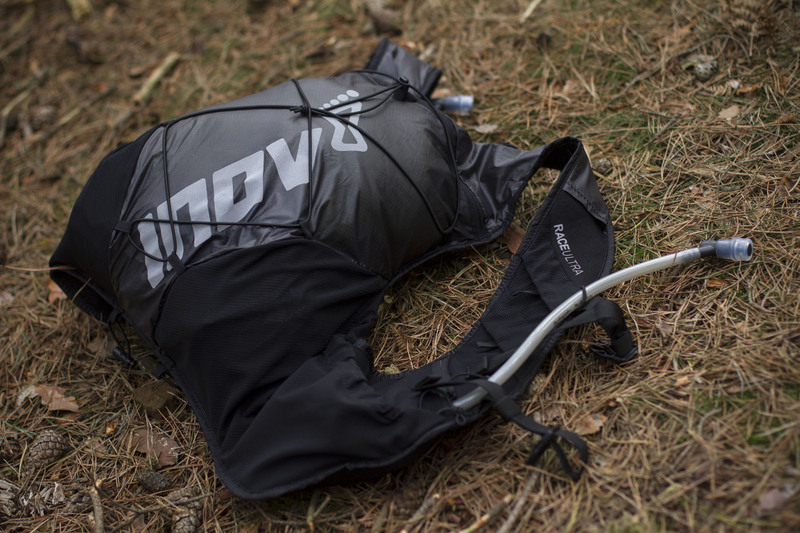 The Inov8 Race Ultra 10 is an outstanding running vest style backpack. So much so I have awarded it the MyOutdoors Running Editors Product of 2015 Award. The Ultra 10 is the complete package and carries out its work in a subtle and classy way. I was never left wanting for more features, never found one that got in the way and it was comfortable regardless of the situation. The best way to sum the Ultra 10 is it is like a fine suit, with the devil being in the detail. The more you use it, the more you discover.